Got that pollen and taking it home. Someone’s headed off to the hive with stash of pollen! How many bees do you see here? And in all the other photos? 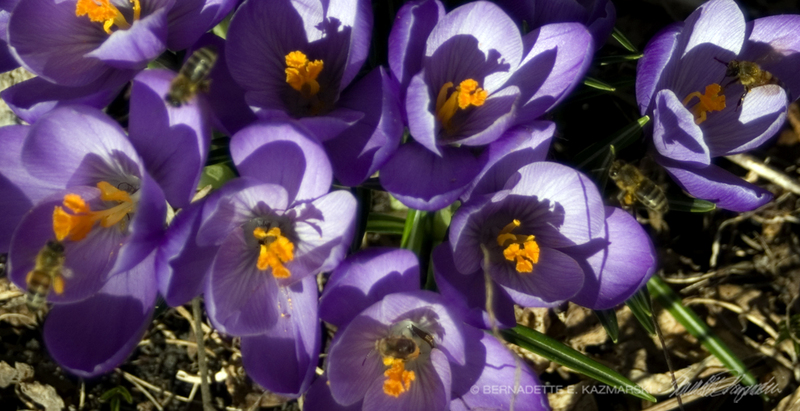 One of them has five bees on these crocuses! 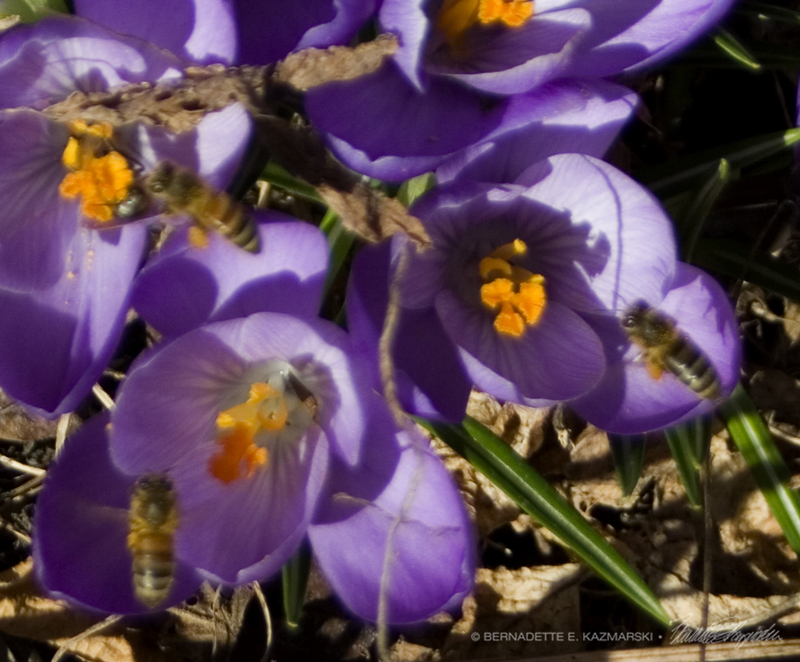 These crocuses were humming with bees as was another clump of them, and as long as the sun was shining the bees were very, very busy. I photographed this back on April 1 when I photographed the “one white crocus” and forgot to share it then. It’s nice to have spring-blooming flowers you can enjoy, but it’s far better for the bees to be able to find an good meal in early spring. 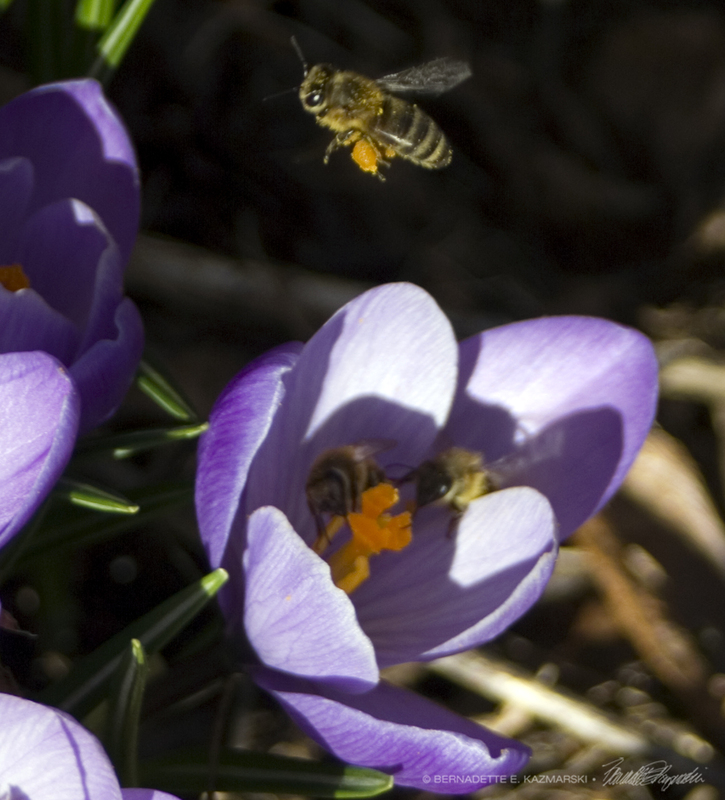 Crocuses, which sometimes bloom even earlier, even during a late spring thaw when bees often awaken in the warmth, are rich in pollen and are easily found by bees. Never underestimate the value of any blooming flower to help keep bees alive—you can help with very little effort in your own back yard. See other of my posts on helping bees in your own back yard and in encouraging wildflowers in your area. 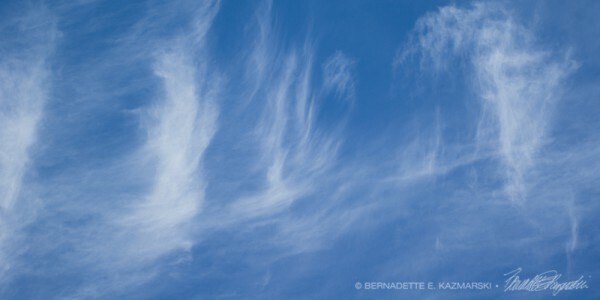 All images used on this site are copyrighted to Bernadette E. Kazmarski unless otherwise noted and may not be used without my written permission. Please ask if you are interested in using one in a print or internet publication. If you are interested in purchasing a print of this image or a product including this image, check my Portraits of Animals shop to see if I have it available already. If you don’t find it there, visit “purchasing” for availability and terms.